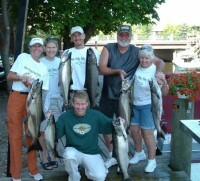 We are a family oriented fishing charter specializing in Salmon, Steelhead, and Lake Trout. 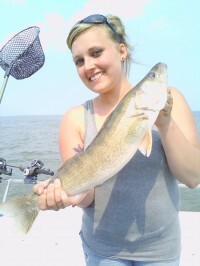 Free Spirit Sport Fishing Charters specializes in Lake Erie Walleye and Perch charters out of Monroe, Michigan. Captain Mike “K” Koslakiewicz is a Christian Captain who has been fishing the Great Lakes for over 18 years. 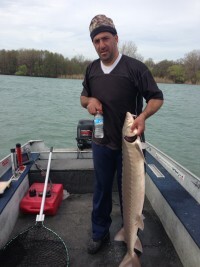 Jigging the Detroit river, If you want to have fun and catch a lot of fish, Captain Nick is your guide ! Come and fish with him ….It will be a truly unforgettable experience! 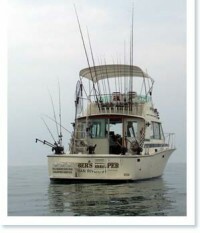 Reel Obsession Fishing Charters offers Lake Michigan charter fishing and specialty cruises. 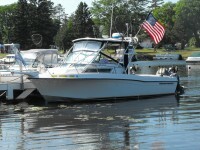 Call Captain Craig Coleman for availability and prices at: 231-233-6021. The concentrations of walleyes off Au Gres (AuGres) and Tawas are truly world class. 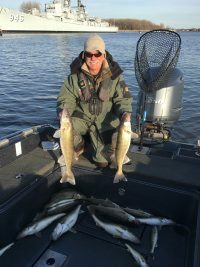 In fact many anglers, including Captain Mike Veine, consider Saginaw Bay to be the Walleye Capital of the World these days. 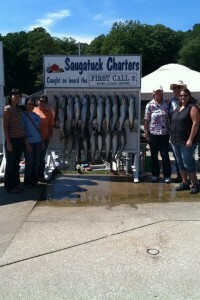 Limit catches are considered normal on Saginaw Bay. The catch typically consists of a good mixture of smaller eating sized fish , medium sized chunkers, and big lunkers for the perfect combination of walleye fishing utopia. In the fall Lake Michigan lights up with giant chinook salmon and rainbow trout and Manistee is some of the best fishing on the Great Lakes. Captain Greg has been successfully fishing and navigating the Great Lake of Michigan for over twenty years. Code Blue starts fishing in April and goes through October to ensure we stay on top of the fish all season long. In fact Captain Greg and his crew are so confident that they guarantee it. 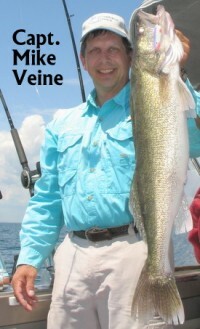 If you do not catch a fish while aboard Code Blue your next trip is free. Come fish with Capt. Rick on the fantastic waters of Lake Huron from Alpena, Michigan . 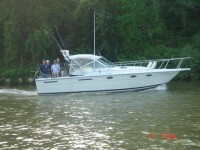 Cast your line off the “Wipe Out”, a 27 foot sports craft, fully equipped and ready to catch your trophy fish. 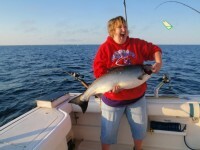 Fishing the deep blue waters of Lake Superior is the Great Lakes fishing adventure. 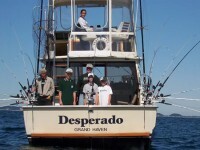 Come aboard Quincy D and join Captain Reid DeRosie for the fishing experience of a lifetime. Whether you are looking to ply the deeper waters of the Big Lake for giant Lake Trout, troll along the rocky inlets and sandy beaches of Lake Superior’s picturesque shoreline for anything from Lake Trout to Salmon, or simply relax on the boat and take in the view, Lake Superior Sport Fishing will provide the experience you are looking for. 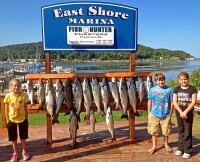 Lake Superior Sport Fishing offers trips for all ages, and skill levels. Near shore and local trips run out of scenic Marquette, Michigan and bring you West along the beautiful shoreline toward Big Bay, East to Laughing White Fish Point, and anywhere in between. 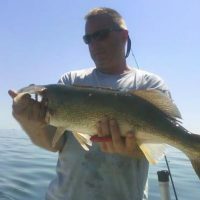 Full time year round guide service in the west Michigan area offering Lake Michigan Charters (Port of Muskegon), Guided fishing trips on inland lakes and rivers. Targeting- steelhead, salmon, trout, walleye, bass. 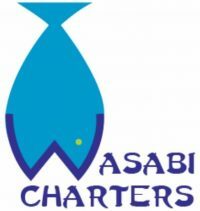 year round charter fishing. Lake Michigan and Saint Joseph River. 30 + years of experience. 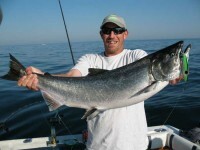 At Originator Charters, we provide all the equipment for you to enjoy the great experience of catching, King and Coho Salmon,Steelhead,Lake Trout,Walleye Perch and Bass. 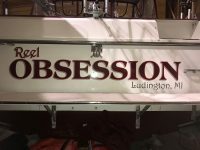 Douglas J Charters in Grand Haven provides a great service to your salmon charter by utilizing our custom fish cleaning station. 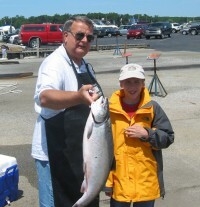 Douglas J Charters will fillet & bag your catch to assure you have the most professional prepared Lake Michigan King Salmon, Lake Trout, Steelhead, Perch and Coho fillets to bring home and share with your family and friends. Fresh King Salmon from Lake Michigan, to the grill. No extra charge for fish cleaning. 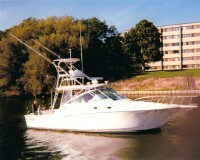 JM Charters operates a beautiful 29-foot Luhrs Sport Fishing Boat name “CorkScrew”. Aboard the “CorkScrew” you will be fishing for, Chinook Salmon (King), Coho Salmon, Steelhead trout (Rainbow Trout), Brown Trout and Lake Trout. 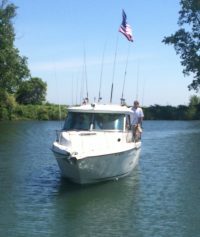 Captain Jim and his mate will work very hard to ensure you have one of the finest fishing and boating experiences that can be offered on the west shores of Lake Michigan. At Double Trouble Sportfishing Charters we are dedicated to providing a quality charter fishing experience. As the fishing seasons change, we follow the fish across Lake Erie & Lake Michigan to ensure that our customers are always right in the middle of the hottest fishing action. From the Lake Michigan ports of Ludington, St. Joseph, & Benton Harbor, to the Lake Erie ports of Bolles Harbor, Monroe, & Luna Pier; we pride ourselves on knowing that we are on the best fishing action for Walleye, Perch, Salmon, and Trout that the Great Lakes have to offer. Experience Lake Michigan Charter Fishing like never before with a first class salmon, trout or steelhead fishing trip with Capt. Art. Based in Muskegon, MI. A family oriented fishing experience. 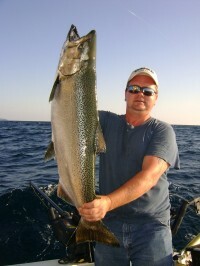 Professional fishing experience catching Salmon and Trout on Beautiful Lake Michigan. You can do it your way while fishing with Miryha. If you want to set lines or the hook, pick your favorite music, or simply sit back and relax enjoying the day, it is all up to you. We like to fish your way. 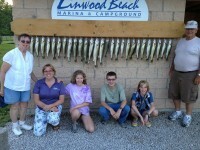 Fishing charters on Lake Michigan from Grand Haven. 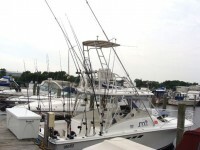 Docked at Barretts Marina Grand Haven – Salmon and Trout. 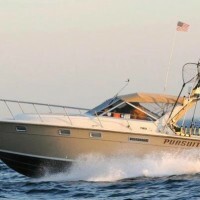 Charter Boat Salmon and Trout Fishing in Manistee Michigan on the Beautiful 31′ Silverton Convertible Killin’ Time III . 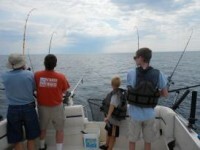 Bring your family, friends or business associates out for a Great Day on the Great Lakes. Captain Jeff “Doc” Shaw has been fishing West Grand Traverse Bay since he was 5 years old. That’s over 40 years. He is a Traverse City Native and has been practicing Chiropractic in Traverse City for the past 23 years. His office is located on the shore of West Grand Traverse Bay, within sight of the “fishing grounds.” He spent 3 years commercial fishing in Kodiak, Alaska, long before the “Deadliest Catch” was in the American vocabulary. With his knowledge of “West Bay,” the success rate on “Well Adjusted” is typically some of the best around. 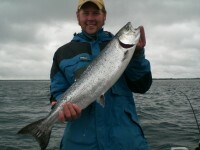 Year round fishing for salmon and trout on Lake Michigan and the Manistee River. Join Captain Paul Schafley for an exciting day on the water. Docked along the Manistee River. River lodging is also available. 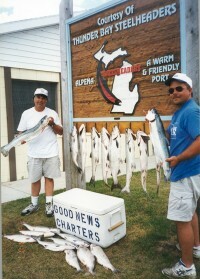 Fish for salmon,trout,and whitefish in calm water within view of Mackinac Is. and the Mighty Mac Bridge. 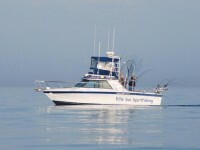 True Blue charters is a charter fishing business captained by Captain Brian Springstead. Brian has fished the waters of northern Lake Michigan for over 35 years. 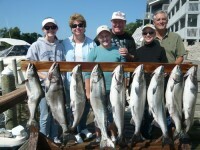 <Half and full day Fishing charters are available for up to six people. 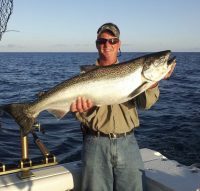 We specialize in Fresh water sport fishing charters on Lake Michigan for coho and king salmon, steelhead, brown trout, and Lake trout. 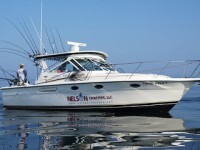 Aboard If-N-When, our focus is to teach you how to catch fish, in a hands on atmosphere. 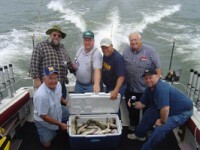 1-4 fishermen, for that great day out with friends, or that one on one fishing experience. Walleye and Perch from the port of Monroe Michigan. 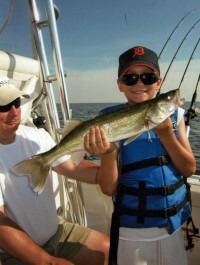 WALLEYE fishing on Saginaw Bay May – Mid. July : This is a world class fishery where we routinely catch limits in May , June and July. To catch a trophy then fish with me in November or December weather permitting. SALMON fishing on Lake Michigan Mid. 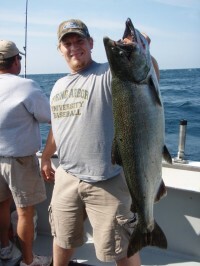 July – October ; Manistee offers some of the best salmon fishing in the continental U.S.
Salmon and Trout fishing charters on Lake Michigan from the port of Ludington. 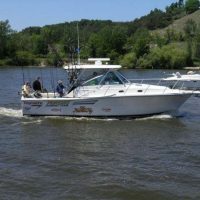 Big Bird Charters, a family owned family ran business, has been operating charter fishing out of Saint Joseph, MI for the past thirty one years and define our success by achieving the highest level of customer satisfaction possible. Captain Scott Anderson on board the Far Fetched for the sport fishing charter boat trip you’ve been dreaming about. Depending on the season, we’re catching King Salmon, Coho Salmon, Lake Trout, Brown Trout, or Steelhead. 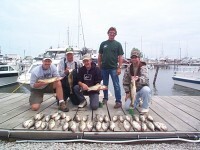 Leland has long been recognized as one of the top fishing ports in the state of Michigan. Large numbers of fish stay in the waters of the Manitou Passage feeding on the smelt, alewives and bait that is abundant in the area. Your trip will begin in Leland, but we fish along Lake Michigan’s shore from Northport to Glen Arbor & Empire to Frankfort. 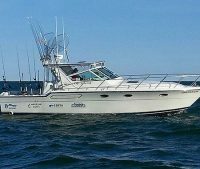 Wet-Net Sportfishing Charters, a complete sport fishing charter boat service fishing for salmon, perch, and walleye on beautiful Lake Michigan and Lake Erie. As the year progresses we follow schools of walleye, salmon, and perch to ensure that our customers are always on top of the best fishing action on the great lakes. 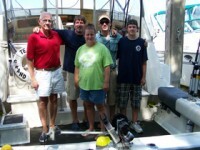 We can provide all your needs for business or family fishing trips and with over 25 years of fishing experience. Call us today to setup the fishing experience of a lifetime. Name of Charter Captain and Restaurant Affiliate: Rod Perry with Scotty’s Restaurant and Blue Moon Restaurant. 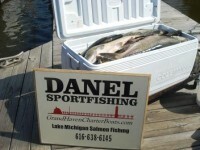 DANEL SPORTFISHING has been located in Grand Haven, Michigan at the famed Chinook Pier fishing facility since 1984 with the primary pursuit of big game Salmon and Trout on Lake Michigan. 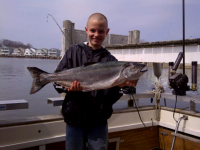 The Port of Grand Haven offers great opportunity for the Lake Michigan fishery of Chinook(King) Salmon, Coho Salmon, Steelhead, Lake Trout, and Brown Trout. We are centrally located within 30 minutes of Grand Rapids, 20 minutes of Holland and 10-15 minutes of Muskegon. Business Website Address (http://www. 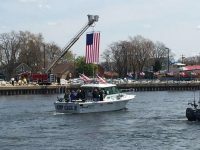 ): Grand Haven Salmon Fishing From $69 Kids Welcome! Adult's Tolerated! 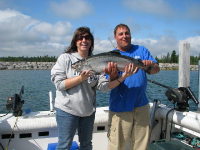 Turning Point Sportfishing is located in both Oscoda, Michigan and Ludington, Michigan. Specializing in Salmon, Lake Trout, and Steelhead. 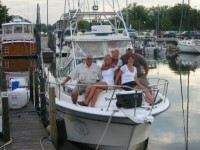 Thank you for visiting our page and we hope to see you soon reeling in your trophy fish aboard the Turning Point. 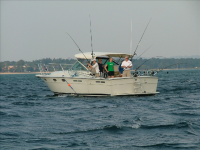 Traverse City charter fishing for salmon, lake trout and steelhead. Business Name: Spinner N Spoon llc. Gold Coast Fishing Company caters to smaller groups of people looking to get out on Lake Michigan or the St. Joe River in chase of salmon, steelhead, and trout. 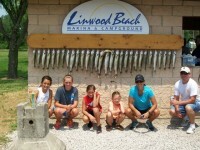 We also offer trips for families and groups of friends who just want to get out on the river and go fun fishing. Whether you are experienced anglers or just looking for a great time on the water, Gold Coast Fishing Company will provide you with an unforgettable experience. Business Phone Number: 616-846-3700 Boat Cell or 616-868-6473 Home Ph. CoHooker Lake Michigan Fishing Charter – First Call. 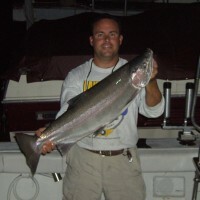 Fishing Lake Michigan for Salmon, Trout and Perch. We welcome both business and family groups, ages 5 to 95. We have provided quality sport fishing experiences for individuals with all types of handicaps, from all walks of life and from all over the world!